THIS Advent, Caroline Grogan is “challenged to be calm and still”. “My family’s life is very busy,” she said. The 26-year-old researcher said she found peace in praying the Rosary and offering her musical talents for the glory of God as part of the Young Adult Ministry (YAM) group at St Stephen’s Cathedral, Brisbane. “Playing music with my friends in YAM and the Timorese community allows me to let go of deadlines and focus on the next note, the next guitar chord,” she said. Considering the snapshot of her family’s various commitments to ministry to the local and broader Church and community, and her chosen speciality of research into dementia care, Caroline said her commitment to outreach, today, was almost unrecognisable. “Five years ago I would not have seen myself as a faith-filled person pursuing academia, after travelling and speaking at different international conferences,” she said. Today, the human and social services graduate and Centacare worker is committed to research based on “nurturing dementia-friendly communities in Brisbane”. Prayer and lived faith in God remains her guiding light. 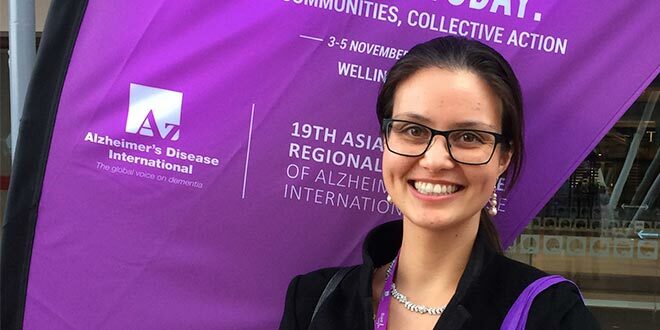 “I pray my research can highlight the gifts and value people with dementia offer society – (and) to de-stigmatise the current notions of a ‘throw-away’ consumer culture which increasingly marginalises people’s dignity once their ‘market value’ drops,” Caroline said. Caroline said the “foundation” of her research “seeks to value people’s voices within context and participant’s expert lived experience”, an aim she said “is missing in these discussions”. Her research also “harmonises” with her work as a Share the Care co-ordinator with Centacare Brisbane, where she “supports carers who support someone living with dementia or (are) frail-aged”. Caroline’s “consistently inspired by Centacare’s mission of … ‘Catholic support services, providing help and creating hope’”, she said. With open doors to conference-speaking in Australia and New Zealand, she was “humbled” to contribute to Brisbane archdiocese’s 2018 Lenten resource and always aims “to offer hope” in outreach. “I pray (people) find hope to keep going, to keep striving and trusting that their self-worth comes from God not societal measures on university results, image or superficial pursuits,” Caroline said. “(They) inevitably stunt our growth in Christ and self-actualisation towards the Kingdom of God. Spurred by the example of many saints, priests and religious, Caroline is quick to quote them. “Pope Francis recently stated, ‘We must open our hearts and embrace the lepers of our times’,” she said. Caroline said this outlook “goes to the core” of her personal and the “Church’s collective ministry”. “I find it helpful to reflect each day on where God was leading me and in which instant did I ignore His presence,” she said. “(I ask) did I stand by as someone was unjustly treated? Was I un-empathetic to someone’s needs because of personal stress? An overarching influence is Caroline’s father John, a missionary teacher and researcher. Caroline attested to the example of the lives of St John Paul II, St Josephine Bakhita, St Therese the Little Flower, St Faustina, St Augustine, St Ignatius and St Padre Pio, “to name a few”. As a single parent, John Grogan was a constant source of humility, hard work and gratitude, she said, also shaping the lives of older siblings Alice and Joe. Locally, Caroline’s inspired by those in and around the archdiocese, and encouraged other young adults to seek the company of these examples of “selflessness”. “Fr Leonard Uzuegbu’s patience with my inquisitive soul in the YAM sharing sessions and his trust and faith in the Young Adult team is inspiring,” Caroline, who was named after Caroline Chisholm, said. “I’ve always seen in him a selfless generosity seeking to guide, comfort and enlighten others. Caroline said she remembered fondly those who had moved onto ministry elsewhere like Fr David Pascoe, Canossian Sister Thao Nguyen and Fr Uzuegbu. She also has a special connection to St Paul de Chartres Sister Teresa Francis Pham, whom she met when travelling to World Youth Day last year, Carmelite Sister Moira Kelly and Canossian Sister Melissa Dwyer. All in all, surrounded by holy company and with the example of the saints, Caroline faces the future with renewed optimism for what she can accomplish in God’s name. “This path of trying to help others has actually allowed me to grow,” she said. “At twenty-six, I have a job in middle management which I enjoy with mentors who I respect, I’m pursuing a PhD in an area I am passionate about and I’ve travelled to present at international conferences with invitations to explore more next year. “I’m not sure where my research will take me; I will take one step at a time and leave the rest to God.